Increasing health consciousness among consumers pertaining to the high cholesterol level will positively influence the oryzanol market growth. It is a natural occuring antioxidant consisting of sterol and triterpene alcohols extracted from the rice bran oil. Maintaining lipid level, aid in body building, and relief from menopause symptoms are among the key identified benefits from the oryzanol consumption. A high cholesterol doesn’t have any specific symptoms and can be avoided casually, which induce the customers to take precautionary dietary supplements or medicines containing oryzanol. In the U.S., more than 50% of the adults who are prescribed to take cholesterol medicine are taking it and, nearly 70% of the U.S. adults check their cholesterol level within five years time span which promulgates the oryzanol market demand. Rising fitness and body building trends among millenials has effectively stimulated the ingredient demand in sports nutrition. Oryzanol is witnessing high penetration in body building supplements due to its increasing testosterone level benefits, which promotes the lean muscle tissue growth. Global sports nutrition spending was estimated at over USD 11.5 billion in 2016. North America dominated the overall sports nutrition market and accounted for over 40% of the demand in the same year. In the U.S., supplements and capsules held responsible for nearly 13% of the overall sports nutrition and weight management market revenue. The absence of regulations and limitations over oryzanol consumption due to its natural content makes the market grow more promising in nature. No recorded health hazards from this ingredient along with high share of under utilized production of rice bran oil will open new opportunities in the industry. Currently, around 80% of the rice bran oil production potential are under-utilized. Increasing penetration of organic nutraceuticals and cosmetic ingredients will stimulate the industrial level processing of rice bran, which in turns will enhance the oryzanol production. High product pricing along with lack of consumer awareness are the key restraining factors in the industry. However, increasing efforts to narrow down the under utilized production gap will reduce the oryzanol price gap during the forecast period. Large scale production will result into more ingredient availability and high bargaining power from the customer side. 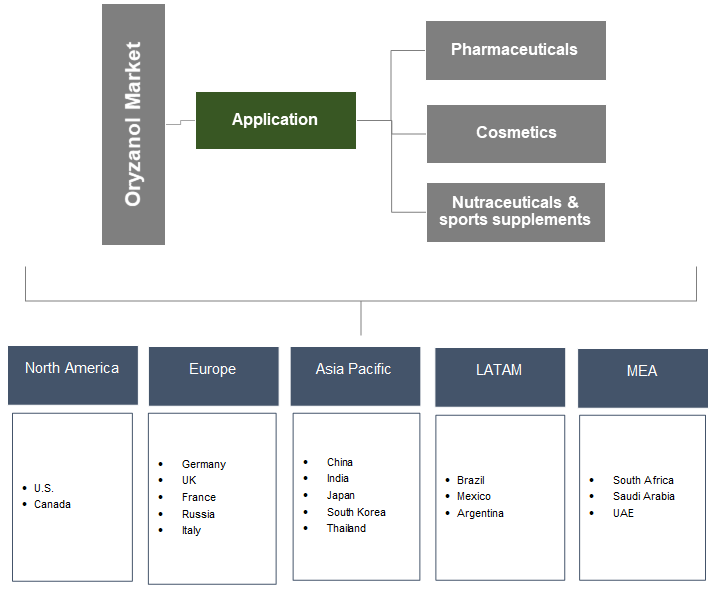 Pharmaceuticals dominated the oryzanol market applications segment and accounted for over 50% of the overall demand in 2018. Increasing health issue occurrences such as high cholesterol, hyperlipidemia, and hormonal changes during menopause has stimulated the oryzanol medicines consumption. Absence of health side effects due to its natural substance makes the product least risky and beneficial to consume. As the above-mentioned health issues are very common and needs to be taken care of immediately to avoid further consequences has positively influenced the demand in the pharmaceutical sector. In 2016, medicines spending was worth over USD 1 billion and is expected to surpass USD 1.5 billion sales by 2025. Cosmetics are the second fastest growing application in the global oryzanol market and is set to witness over 12% CAGR up to 2025. Presence of strong antioxidant properties which prevents the tissue damage and eliminates free radicals will promote the ingredient usage in the anti-ageing creams and sunscreen lotions. Also, easy solubility and absorbability along with effective blood circulation in the skin are key benefits associated with oryzanol based cream formulations. Nutraceuticals & sport supplement application will witness the fastest growth during the forecast period. Increasing demand for body building supplements from athletes due to its organic nature has benefitted the oryzanol penetration in sport nutrition. No legal limitations on national level athletes and other consumers over the treatment of these ingredients makes the product more approachable to all kinds of customer groups. 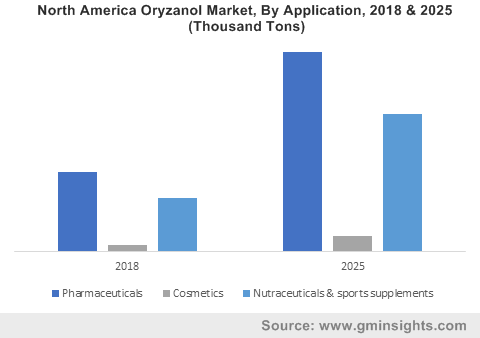 North America oryzanol market accounted for more than 30% of the overall industry share in 2018. Rising cases of high cholesterol among young and geriatric population have positively influenced the regional product penetration. High consumer purchasing power along with increasing health awareness programs by government will encourage the development of health supplements in the region. Asia Pacific is set to witness highest gains and will surpass USD 1.2 billion revenue by 2025. Abundant availability of rice bran, the presence of key industry manufacturers and economical extraction process will support the regional industry growth. Rising fitness trends in the nation with high ratio of young population in India, China, and Indonesia will provide ample opportunities in the sport supplement applications. Millennials hold the largest spending power in the region and is expected to surpass USD 6 trillion disposable income by 2020. Middle East & Africa oryzanol market will observe over 13% CAGR up to 2025. High disposable income accompanied by rising risk of heart attacks due to improper eating habits will induce the oryzanol supplements demand in Middle Eastern countries. The global oryzanol market share is consolidated in nature. Most of the companies are based in Asia Pacific due to the large availability of rice bran. Key industry players include Oryza Oil & Fat Chemical, TSUNO, Henry Lamotte Oils, Okayasu, Delekang Food, Jining Ankang Pharmaceuticals, and Kangcare. Rising efforts to utilize the maximum potential from rice bran oil extraction will result into the new player entrance in the market. Lack of patent registrations in the industry makes the market easy approachable for new manufacturers. Also, downward price trend will also impact the company’s profitability and share in the oryzanol market. Oryzanol is an antioxidant extracted from the rice bran oil. This naturally occurring substance is highly used as an ingredient in medicines to control high cholesterol, menopause symptoms, and as a body building supplement. In pharmaceuticals, the ingredient is highly recommended for cholesterol control medicines and as a relief medication from menopause symptoms. General dosage for both the medications is 300 mg daily. The ingredient finds application in the cosmetic industry for sunscreen lotions, anti-ageing creams, and skin whitening cream. The minimal dosage for skin care is around 100 mg. Also, it is frequently consumed as a health supplement due to its advantage in increasing testosterone and improving strength during exercise. Approximately, 500 mg is recommended in sport supplements.